First coined by founder David Stare in 1987, the term "Old Vine" has special meaning to our winery. Although there is no legal definition, we define an old vine vineyard as having vines that average more than 50 years in age. 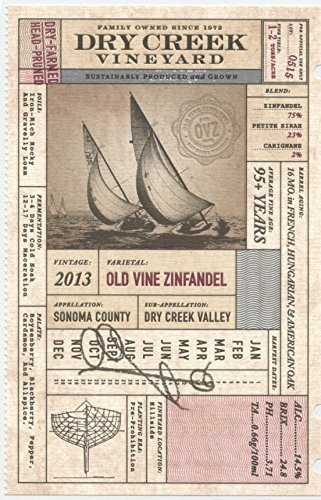 In the case of our Old Vine Zinfandel, the vines are more than 95 years in age and in some cases, more than 110 years old! 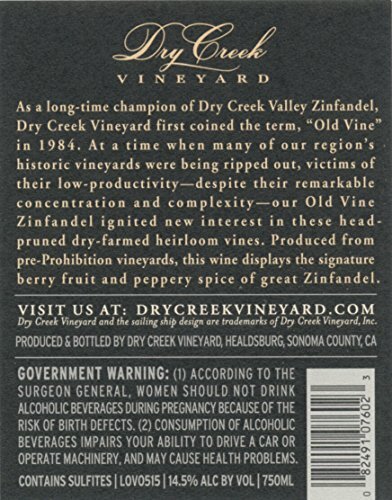 Old Vine Zinfandel vineyards remain the most prized and historic of all plantings in the Dry Creek Valley. The 2013 harvest will be remembered as a season of near perfect growing conditions. It was also one of our driest seasons on record. By mid-January, it seemed that Mother Nature turned off the rain spigot. Overall, winter was extremely mild. Spring budbreak was normal with frost of little or no concern. The summer growing season was outstanding with moderate temperatures. Harvest conditions were excellent. Yields were normal and the quality was superb with all varietals achieving optimal ripeness levels.